Good Morning Everyone! Sorry it has been so long since I have posted but I have been busy getting ready to go to Creative Keepsake Convention and then going to convention. I had a great time taking classes, shopping, eating and enjoying great friends. 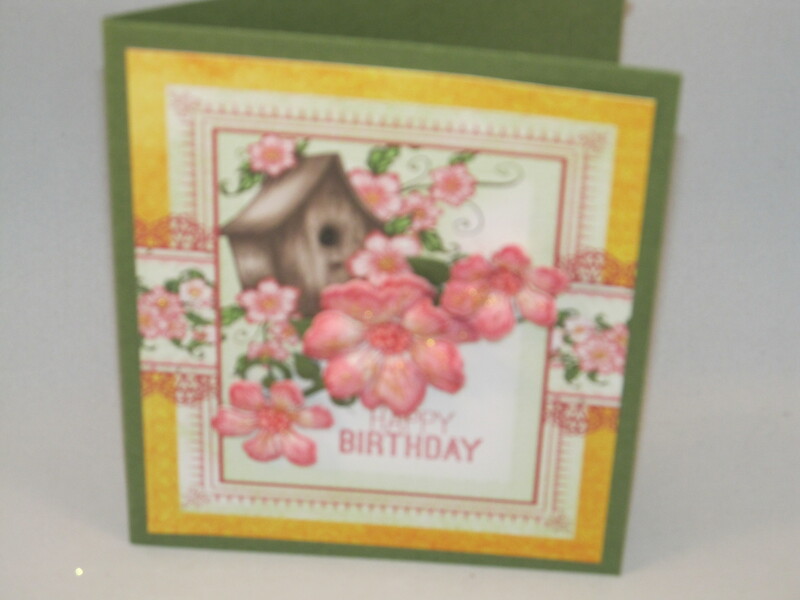 My post today is using one of Susan’s Garden new dies and one of Karen Burniston’s pop up dies. It was hard to get a good clear picture because of the shine from the glitter. 1. 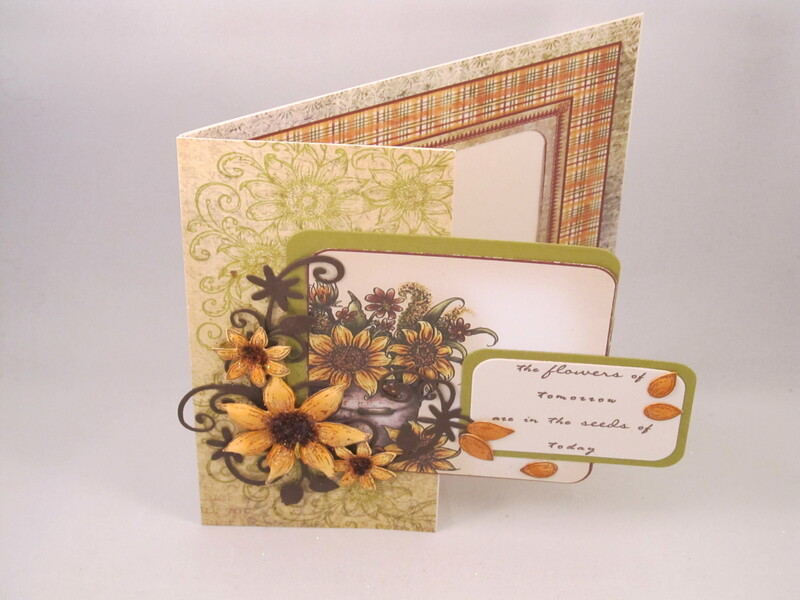 Panel is made by using Karen Burniston’s accordion rectangle die. 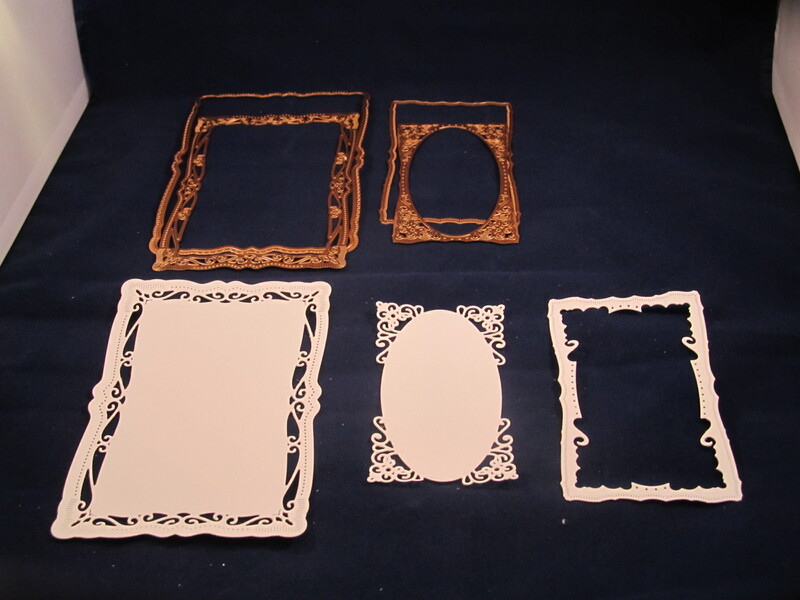 Attach a piece of sticker paper 4-1/2 X 5-3/4 to a pc of white cardstock the same size using clear double sided adhesive. Cut 1 frame from this. 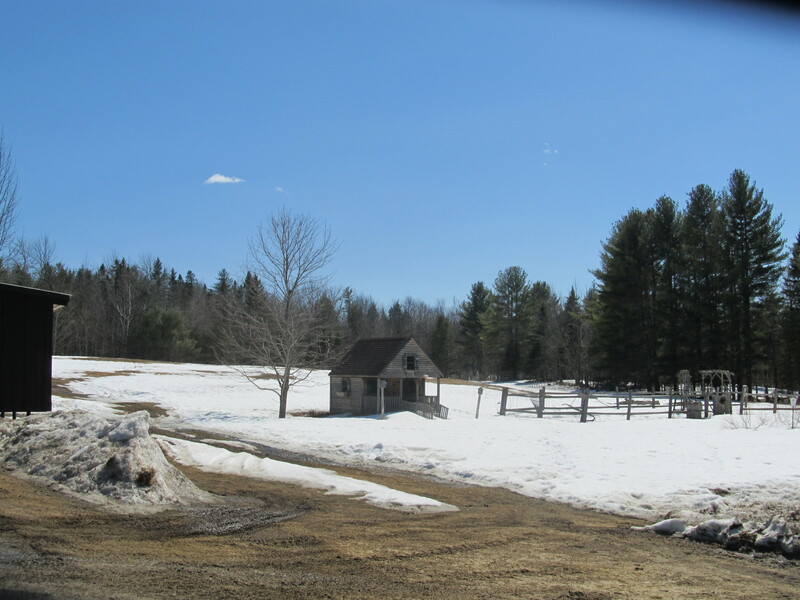 Cut the rectangle and tabs from center of frame and the long tab on the left edge of the frame. 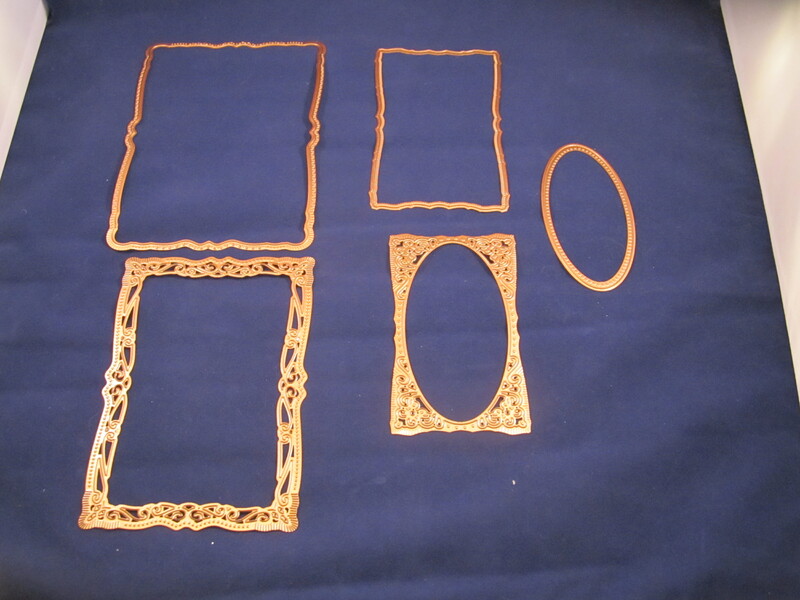 Run this frame through Sizzix machine using Hearts Entwined embossing folder (or other embossing folder of your choice) Peel the paper from the front of the frame ( protective paper covering adhesive) sprinkle glitter over all the adhesive and burnish in then brush away any excess. 2. 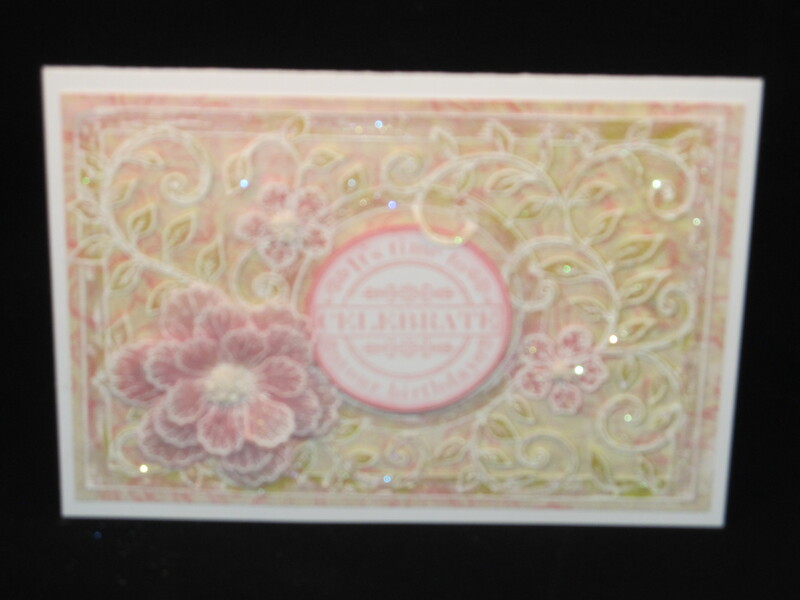 Cut a pc of green cardstock 3-3/4 X 4-3/4 and emboss using Lots of Dots embossing folder. Sand lightly. 3. 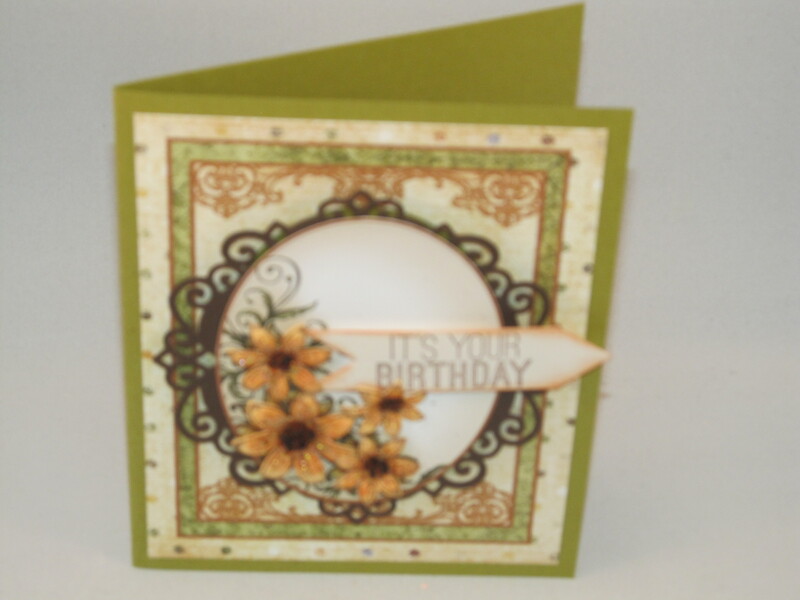 Attach green embossed cardstock to the back of the frame and then attach frame to the front of the card base. 4. 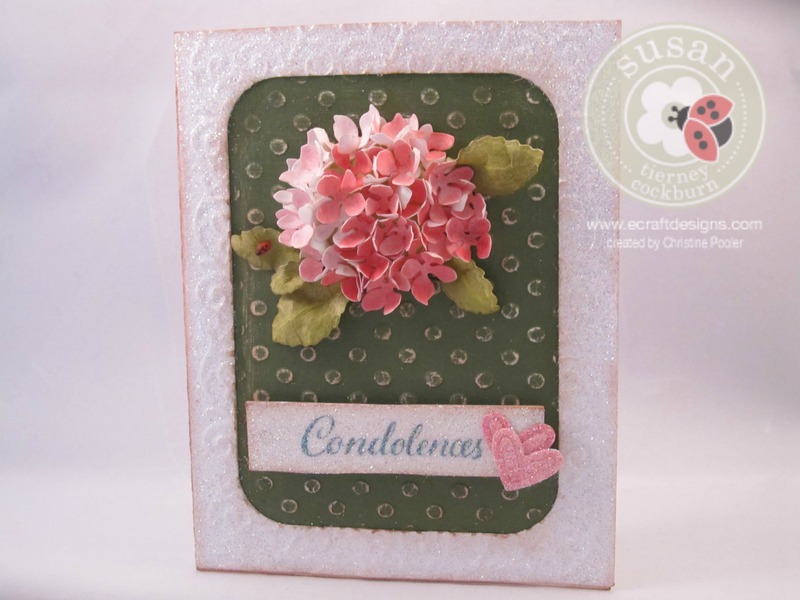 Make your hydrangea using Susan’s Garden new Hydrangea die coming soon at Elizabeth Craft Designs. 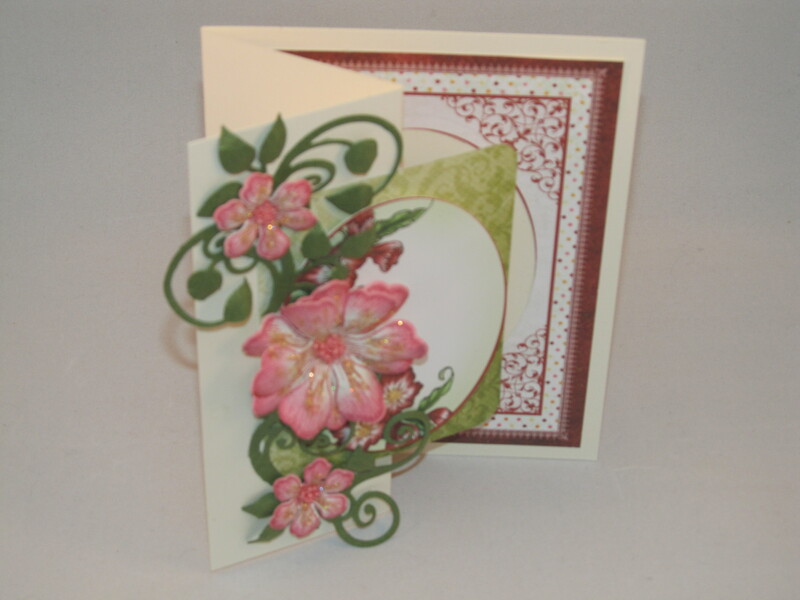 I used Susan’s great video for her Garden Notes Hydrangea die for guidance see video here Using Pan Pastels color white cardstock with Permanent Red, Permanent Red Tint (pink), and Titanium White varying the shades of color then cutting the petals. For the leaves and base I colored white cardstock using Pan Pastels Bright Yellow Green and Bright Yellow Green Shade (this one was from set 2 of Pan Pastels) then cut the leaves and base. 5. 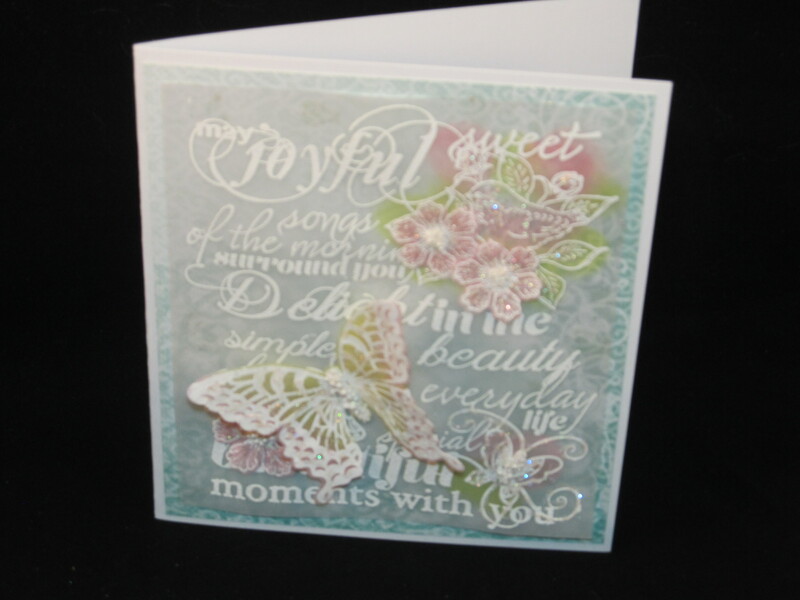 Heat emboss sentiment onto a die cut shape then cover with clear double sided adhesive. Remove protective paper and add glitter and burnish in. 6. Color a small pc of white cardstock with Red and Pink Pan Pastels. Cover pc with clear double sided adhesive and cut a couple of hearts using heart die from the Acccordion Rectangle die set. Peel off protective paper and add glitter. 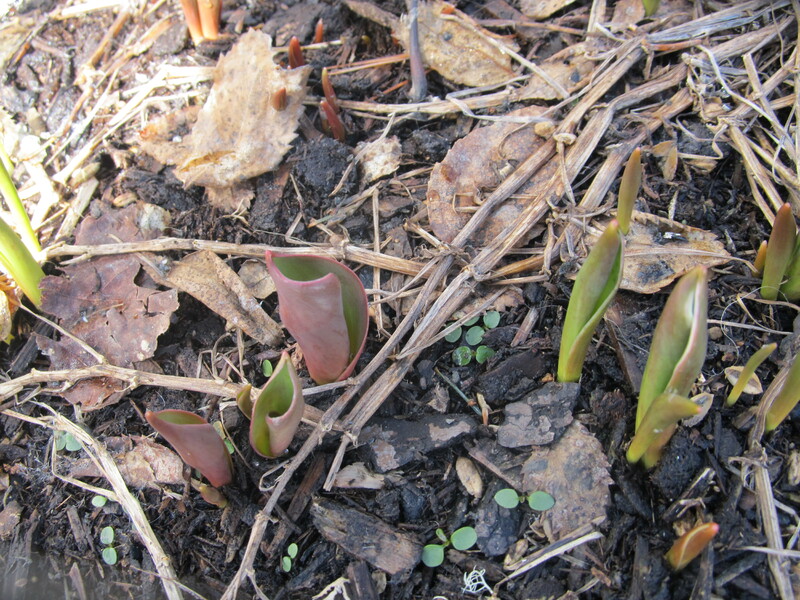 Attach to the left of the sentiment. 7. 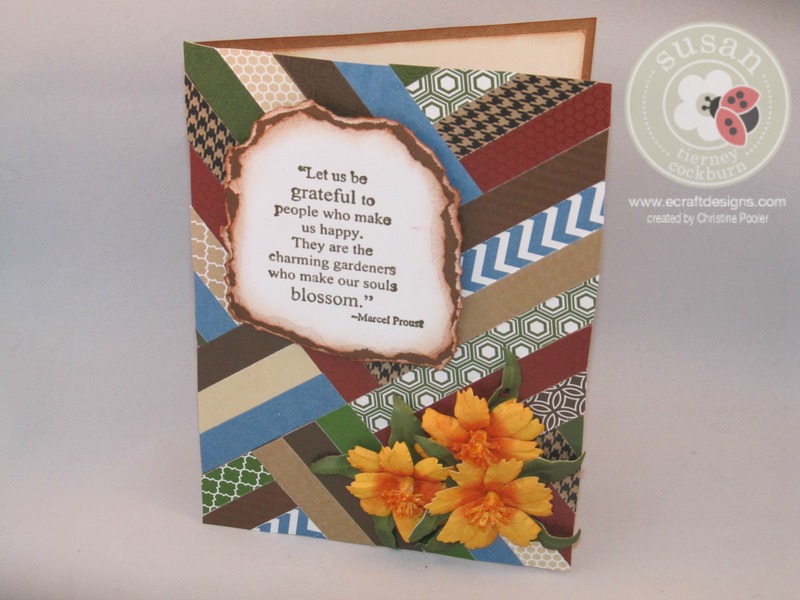 Add sentiment to inside of your card. Today I am posting a birthday card I did for my sister. 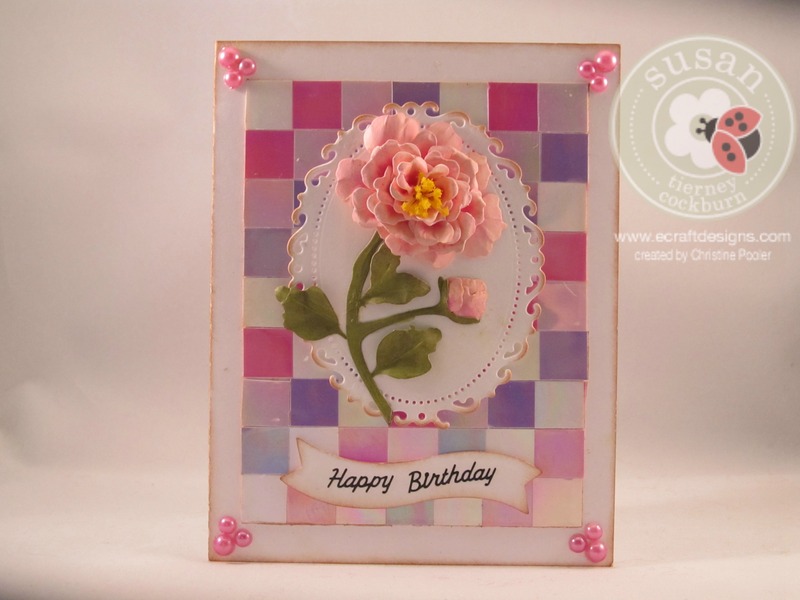 I had a piece of mosaic tile left II had made extra) from a previous card I had done for Elizabeth Craft Designs so I thought I would use it along with an extra pink peony. 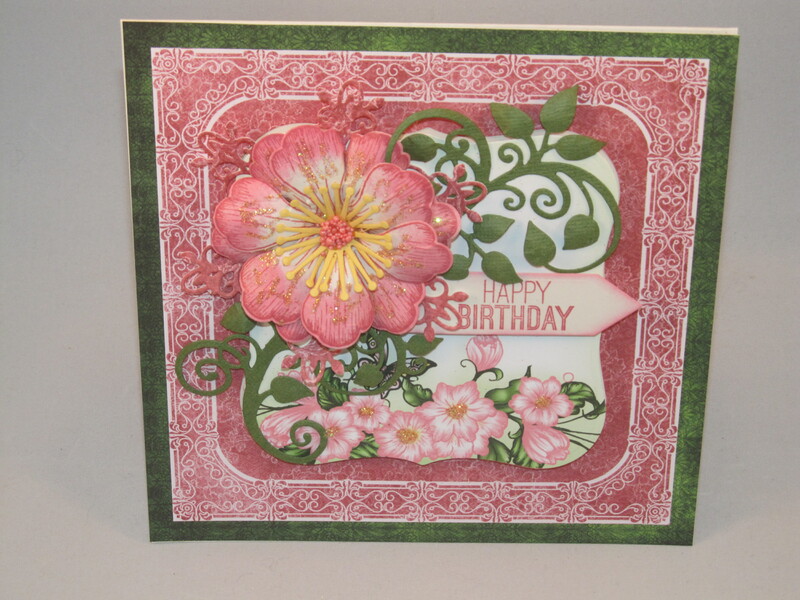 The mosaic was made with Shimmer Sheetz and the peony was made using Susan’s Garden Notes peony die. 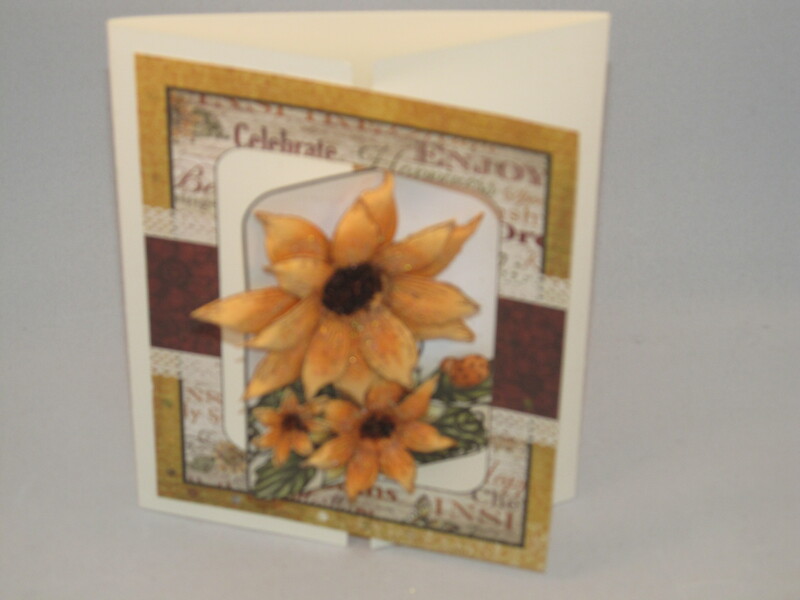 This card is a standard A2 card (4-1/4 X 5-1/2). 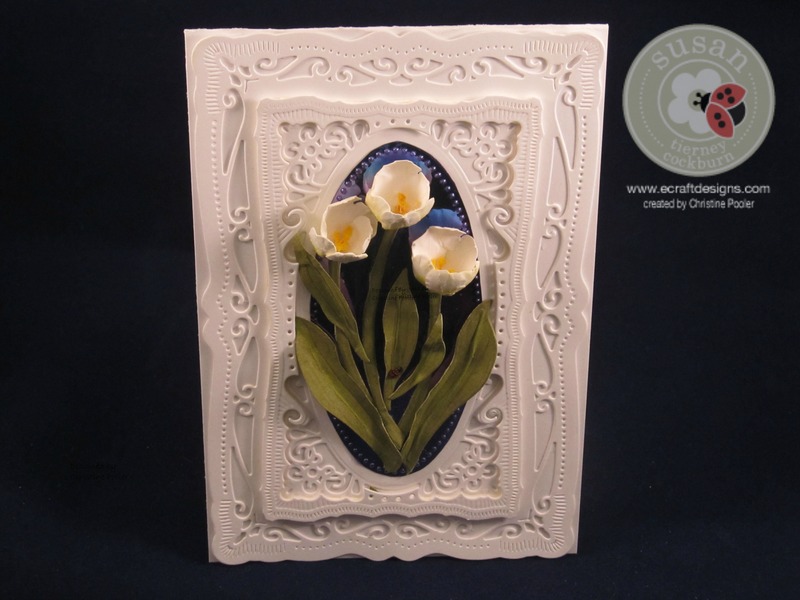 The Mosaic tile instructions can be found here at Elizabeth Craft Designs Blog under Blooming Peony. 1. 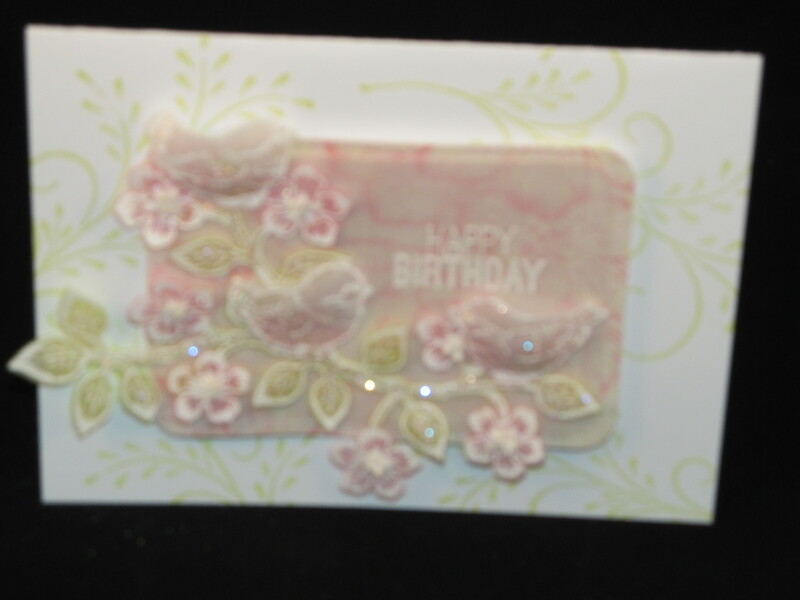 Attach the mosaic tile piece to front of card using clear double sided adhesive. 2. 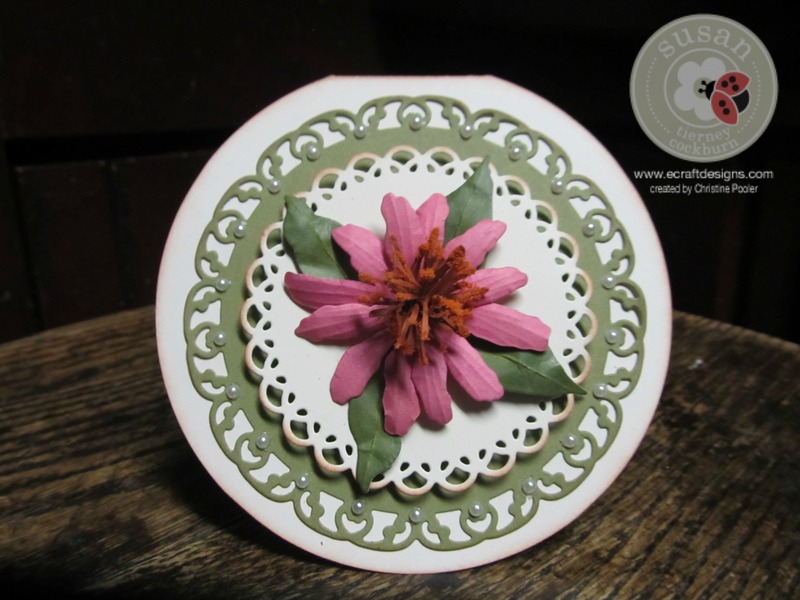 Cut 1 Floral Oval (next to largest die) from white daisy cardstock. 3. Attach to center of mosaic tile piece using foam mounting tape. 4. Banner was cut from Cricut CTMH Artiste cartridge. 5. 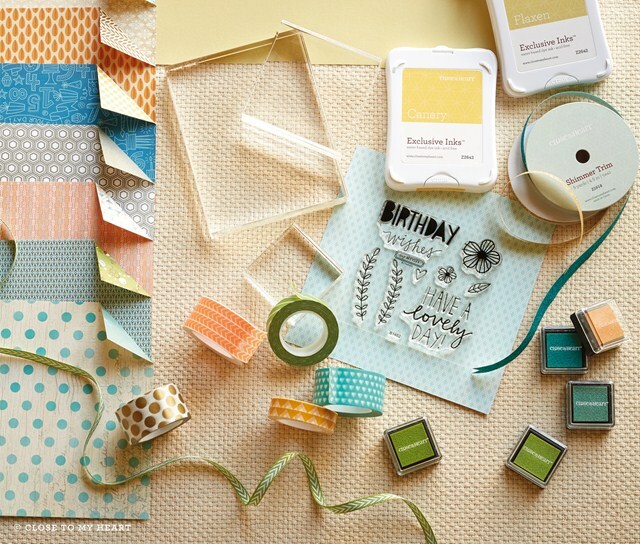 Attach Happy Birthday Peel Off Sticker (ECD) to the banner and attach banner under the oval using foam mounting tape. 7. Add a sentiment inside the card. 8. Add pearls to corners. 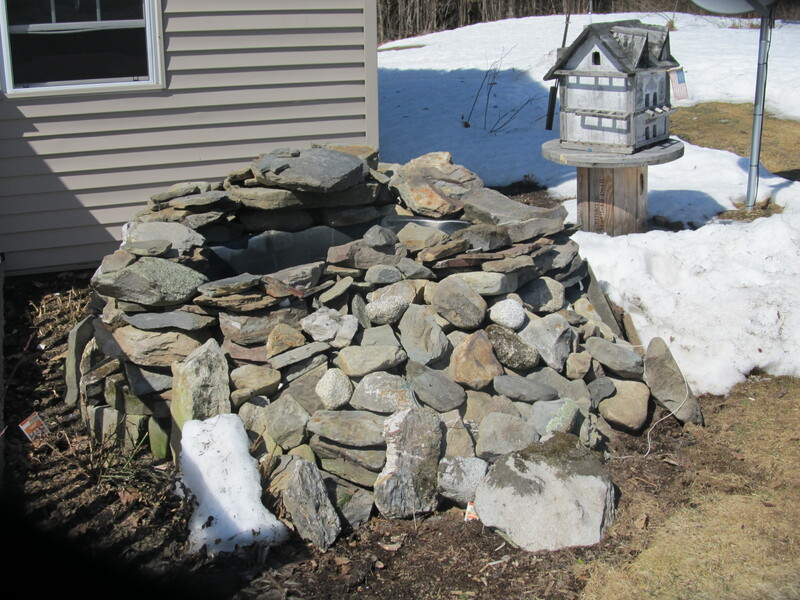 I do hope that you have enjoyed this post and it will inspire you to try your hand at it.